Every year since 2005, World Champion Paolo Bettini has won a stage of the Tour of Spain – and in 2008, the Italian has done it again, outsprinting Philippe Gilbert and Alejandro Valverde in a tough finish in Toledo. Bettini had tested the water on the hilly run-in to Cordoba on stage three, but was reeled in with 10 kilometres to go. Three days later, the Italian played much more of a waiting game on the interminable series of short climbs and fearsome descents in the closing kilometres of stage six. Thanks to the ultra-complicated finale, the main bunch was whittled down to less than 50 riders – most of them either the favourites or riders like Bettini who are specialists in this sort of Ardennes Classics-like finish. As the bunch came over a last short climb in the final kilomere, a desperate last acceleration by Gilbert (Francaise des Jeux) with 200 metres to go was all the World Champion needed as a springboard to move ahead. Bettini squeezed past the Belgian to finish less than half a bikelength ahead. It was close – but Bettini had calculated the distance he needed to win down to the last millimetre. This win indicates that Bettini is well on track for the World Championships in Italy this September – the race which may be the last of his career. Valverde?s third place enabled him to gain time on the other favourites, but Chavanel was the rider who played the time bonuses game the most skilfully on stage six. By nabbing first place in two intermediate sprints, the Frenchman leapfrogged ahead of Astana?s Levi Leipheimer to take his first ever lead in a major Tour. ?The last Frenchman who took the Vuelta lead was Laurent Jalabert.? Chavanel pointed out. ?It?s an honour to succeed him in the palmares of the Vuelta, even though I did come here looking for stage wins.? ?I will try to defend this lead, too, on the mountain stage to Andorra on Saturday. This is a major Tour and the leader?s jersey is not something to throw away lightly.? 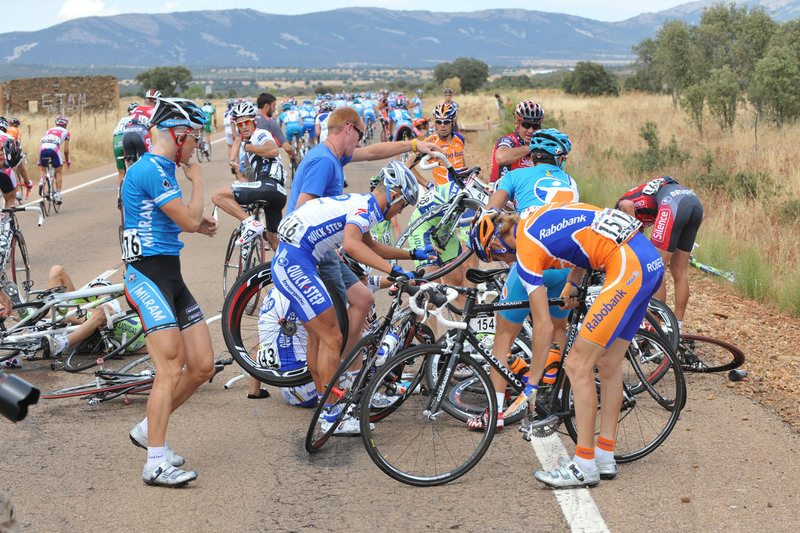 Friday is a rest day on the Vuelta – although ?rest? is a relative term. Race followers will be driving over 700 kilometres from Toledo to Saturday?s stage start in Barbastro. The riders are luckier – they?re going by train. 10. Matti Breschel (Den) CSC-Saxo Bank all at same time.